While Pipkin's been hitching rides on motorcycles and hiking in the mountains, Clover's kept herself busy in the kitchen. Her latest: figuring out what to do with a whackton of hazelnuts! A friend lent her a wonderful recipe book full of hazelnut recipes for appetizers, soups, fish, poultry, meat, savoury and sweets and desserts, but the choices were overwhelming! 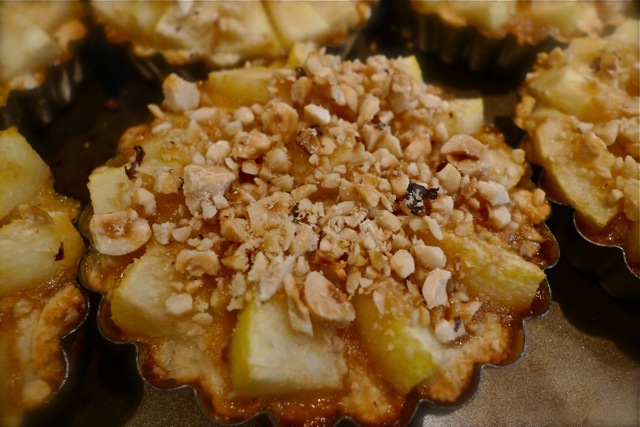 Finally, she settled on making these individual sized tarts, or "tartlets," as she prefers to call them. They're perfect served warm with a dollop of whipped cream or ice cream on the side. 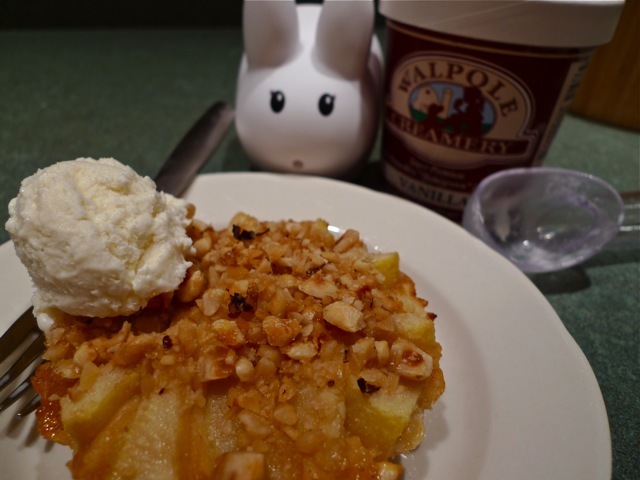 Clover likes Walpole Creamery Vanilla Ice Cream for its all natural made-from-scratch sweet cream base. It's made with rBGH-free dairy from Echo Moon Farm in Walpole, NH, just a stone's throw across the river from Bellows Falls VT. Position a baking rack in the center of the oven and heat oven to 375 °F. Peel and core pears, rub with fresh lemon juice, and set aside. 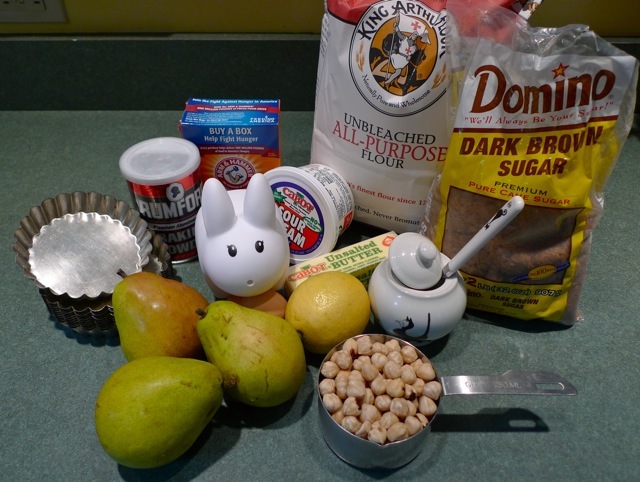 In a food processor work bowl fitted with a metal blade, place flour, sugar, baking powder, baking soda, and 1/2 cup toasted hazelnuts. 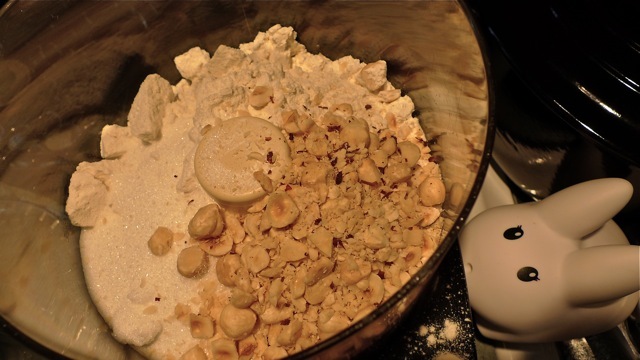 Process until nuts are finely chopped, about 30 seconds. Add butter and process until it is like a coarse meal. Whisk egg and sour cream together and pour over flour mixture. Process just until ingredients are evenly moistened, about ten seconds. Spray 6 individual tart tins with nonstick vegetable spray. Spoon batter into pan and, with moistened finger tips, spread evenly over the bottom and about halfway up the sides. 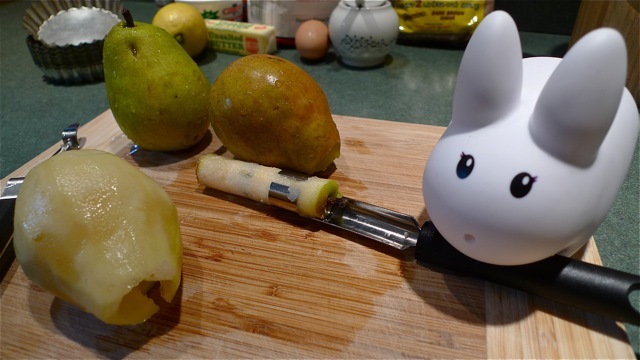 Slice pears into 1/4 inch slices. Spread slices on top of the batter to form an overlapping circle, reserving enough slices to also cover the batter in the center. 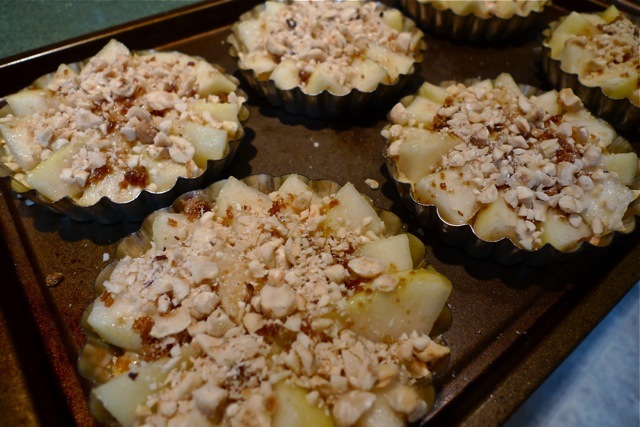 Squeeze lemon juice over the pears, and sprinkle with brown sugar and the remaining coarsely chopped hazelnuts. Place the individual tarts on a cookie sheet and bake in the center of a preheated 375 °F oven until puffed and golden, about 20 - 25 minutes. Let cool for about five minutes and, with the tip of a knife, release the pastry from the pans. Serve slightly warm or at room temperature with vanilla ice cream or whipped cream. Oh my gosh that looks so delicious!!! I'll have to bake that sometime.... By the way all the stuff u cook looks delicious and i cant wait to cook them!! !